Hsp90, one of the most abundant and conserved molecular chaperones, is the major soluble protein of the cell and most commonly located in the cytoplasm. A small fraction of Hsp90 is also present in the nucleus where it shows several structural and functional properties. Apart from their cytosolic localization, Hsp90 paralogs can be found in other cellular compartments such as Grp94 (HspC4) in the ER, Trap-1 (HspC5) in mitochondria, and cpHsp90 (AtHsp90-5) in chloroplasts. Moreover, HSP90 proteins can also be located outside of cells although HSP90s have neither any signal peptide for secretion via the ER/Golgi secretory protein pathway nor a recognizable transmembrane domain for membrane anchoring. As originally reported by different groups, Hsp90 is expressed on the cell surface where it functions as a tumour antigen or facilitates antigen presentation to APCs 1,122,123. A range of HSPs including Hsp90 and Grp94 have been found in the extracellular matrix during and after necrosis 124,125,126. Remarkably, HSPs are not released from apoptotic cells 124,125,126. It has been shown previously that normal cells secrete Hsp90 in response to environmental insults including heat shock 127. In B cells, heat shock was found to induce secretion of Hsp90α via a non-classical exosomal protein secretory pathway 128. As demonstrated in this study, Hsp90α was located within the exosome lumen, and not present at the exosome surface, suggesting that such exosomes may not interact with target cells through cell surface HSP receptors. Secretion of Hsp90α was also observed after exposure of rat vascular smooth muscle cells to oxidative stress followed by an activation of the ERK-1/2 pathway 129. HIF-1α, the oxygen-regulated subunit of HIF-1, obviously plays a crucial role in mediating hypoxia-induced secretion of Hsp90α rendering HIF-1α a key upstream regulator of Hsp90α release 130. It is interesting to note that γ-irradiation was found to induce release of Hsp90β, but not of Hsp90α, via exosomes in a p53-dependent manner 127. 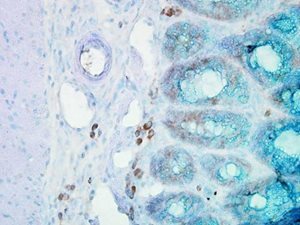 In contrast to normal cells, tumour cells have been identified to constitutively secrete Hsp90. Since over-expression of HIF-1α occurs in almost 40% of human tumours, surface expression and/or release of Hsp90α should become constitutive in tumours over-expressing HIF-1α 26. This conclusion is supported by several findings demonstrating secretion of Hsp90α in different types of tumour cells such as osteosarcoma cells 131, breast cancer cells 132, and colorectal cancer cells 133. Notably, MG63 osteosarcoma cells were identified to secrete Hsp90β into the extracellular space which inhibits the activation of latent TGF-β1 134. The authors could also demonstrate that TGF-β1 stimulation of MG63 cells resulted in the increased cell surface expression of Hsp90β. By using dimethyl amiloride (DMA) which selectively blocks the exosomal protein secretory pathway, it became apparent that membrane translocation and secretion of both, Hsp90α and Hsp90β does not occur through the classical ER/Golgi protein secretory pathway 135,136,137,138. This finding is supported by the fact that Hsp90 secretion is resistant to Brefeldin A treatment, a classical inhibitor of ER/Golgi-dependent secretory pathways 139. Studies with neutralizing anti-Hsp90α antibodies clearly demonstrated that extracellular Hsp90 exists in a free soluble form 130,132,140.